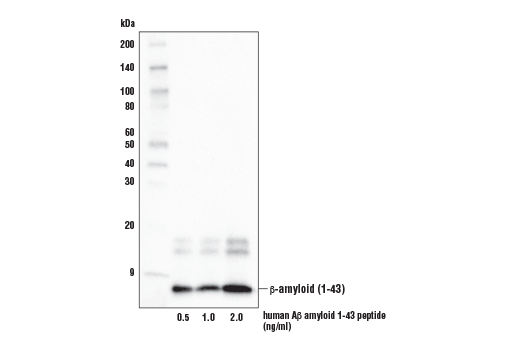 Western blot analysis with the indicated amounts of human β-amyloid (1-43) protein using β-Amyloid (1-43 Preferred) (E8C2D) Rabbit mAb. 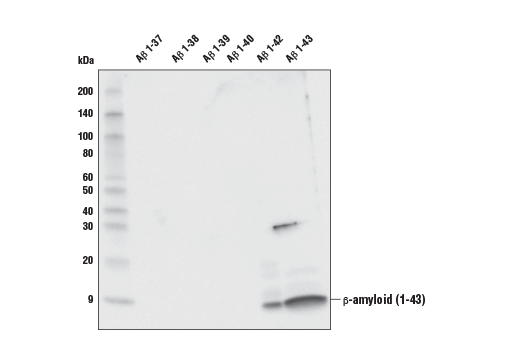 Western blot analysis of human Aβ-37, Aβ-38, Aβ-39, Aβ-40, Aβ-42 and Aβ-43 peptides (10 ng) using β-Amyloid (1-43 Preferred) (E8C2D) Rabbit mAb. Note the slight cross-reactivity with Aβ-42. 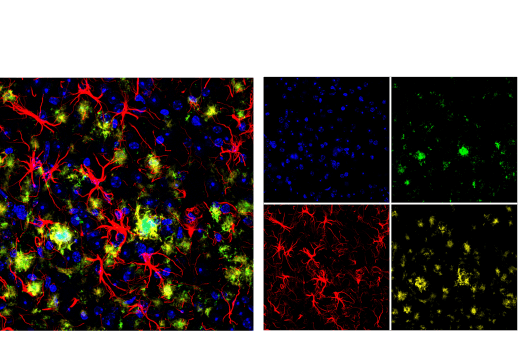 Confocal immunofluorescent analysis of brain from the 5XFAD mouse model of Alzheimer's disease using β-Amyloid (1-43 Preferred) (E8C2D) Rabbit mAb (green). After blocking free secondary antibody binding sites with Rabbit (DA1E) mAb IgG XP® Isotype Control #3900, the tissue was then labeled using GFAP (GA5) Mouse mAb (Alexa Fluor® 555 Conjugate) #3656 (red pseudocolor) and β-Amyloid (D54D2) XP® Rabbit mAb (Alexa Fluor® 647 Conjugate) #42284 (yellow pseudocolor). Samples were mounted in ProLong® Gold Antifade Reagent with DAPI #8961 (blue). β-Amyloid (1-43 Preferred) (E8C2D) Rabbit mAb recognizes endogenous levels of total human Aβ-43 protein. This product detects transgenically expressed human APP in mouse models. This antibody weakly cross-reacts with human Aβ-42 protein. Monoclonal antibody is produced by immunizing animals with a synthetic peptide corresponding to residues near the carboxy of human β-Amyloid (1-43) protein. Aβ43 has been suggested as a biomarker in early onset of Alzheimer's disease, where patients have lower levels of Aβ43 in cerebrospinal fluid (7,8,9). Several studies have shown that Aβ toxicity of Aβ43 is as high as Aβ42 or Aβ40 in different models of Alzheimer's disease, including mouse models and human disease. (10). Lauridsen, C. et al. (2017) Front Aging Neurosci 9, 210. Almdahl, I.S. et al. (2017) Front Aging Neurosci 9, 9. Pachahara, S.K. et al. (2015) PLoS One 10, e0136567. Trambauer, J. et al. (2017) Methods Enzymol 584, 157-183.